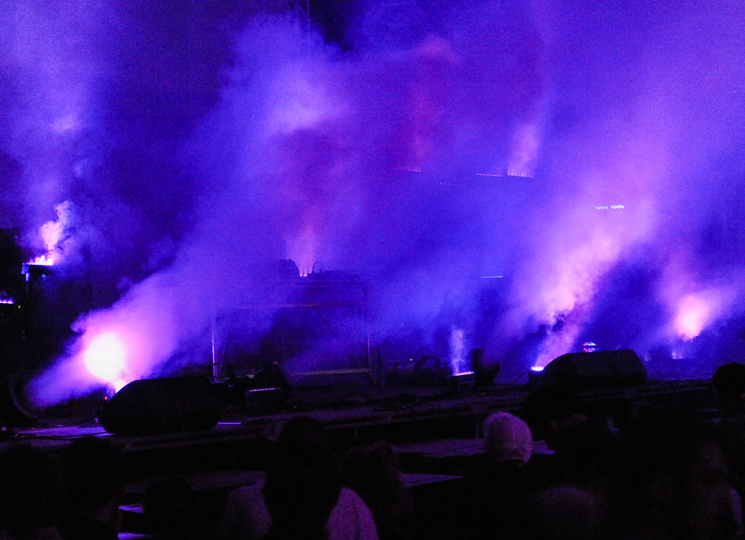 Tim Hecker's performance was wordless, but the ambiance spoke for itself. Awash in fog that shared the blue and purple colour palette of the cover to his latest record, Love Streams, the Montreal expat dutifully crafted the pretty synth twinkling of that album, as opposed to the more lush, sweeping chords of his earlier works. Hecker provided an uplifting counterpoint to the menacing bass that dominated most other performances, instead using the ambient textures to relax and provoke, opting to hypnotize rather than pulverize. Highlight "Music of the Air" from Love Streams best balanced the stretched, ambient synths with hazy string samples. The rest of the set, a blurry mélange of harpsichordal synths and samples, brought subtle bursts of glitch and drone. There were no antics or gimmicks, just Hecker and his music — and the relentless fog rendered the composer as little more than a silhouette shrouded by blobs of colour, but his music cut cleanly through.